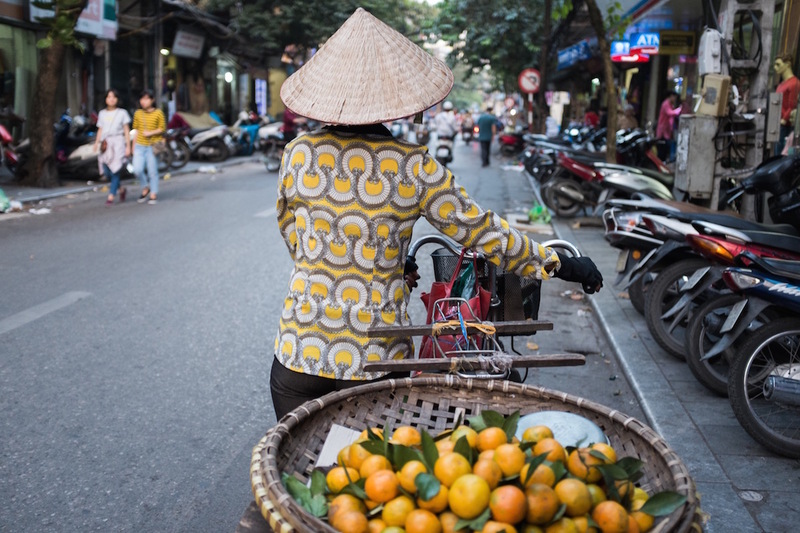 After my recent trip to Hanoi, I ended up deleting about 98% of my photos. It was a photo-editing blood bath. Let me tell you why. On my first morning in Hanoi I went a sports bar shortly after sunrise in order to watch game seven of the World Series. I drank coffee most of the game, but my new found and incredibly drunk Chicagoan friends insisted I have a beer after the 7th inning stretch. I grudgingly went along and ordered a brew. The next two days, even while sober, I continued to find the photogenic and interesting city a challenge to shoot. 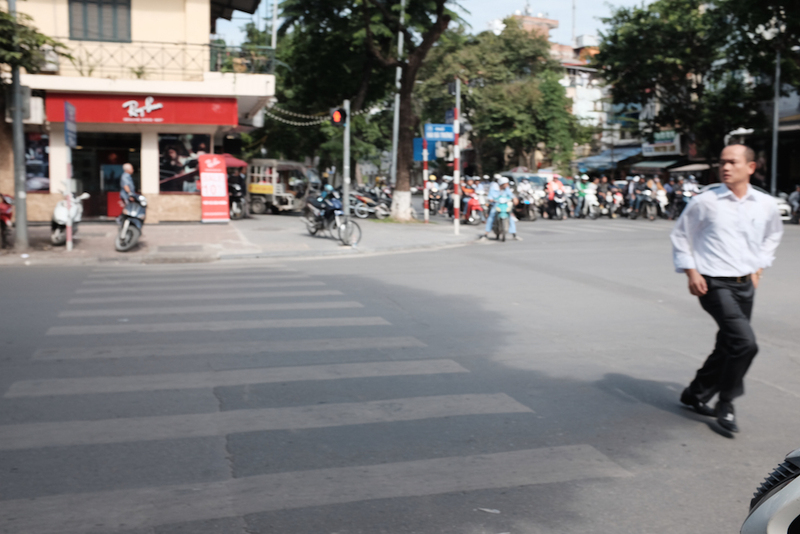 The narrow streets, constant buzzing of motorbikes, and frenetic pace of life made it hard for me to focus my attention. I was constantly trying to capture the energy instead of finding order in the chaos. Someday I will return and I am sure I’ll get better shots after learning from the experience. Anyhow, here are a few keepers from the weekend. 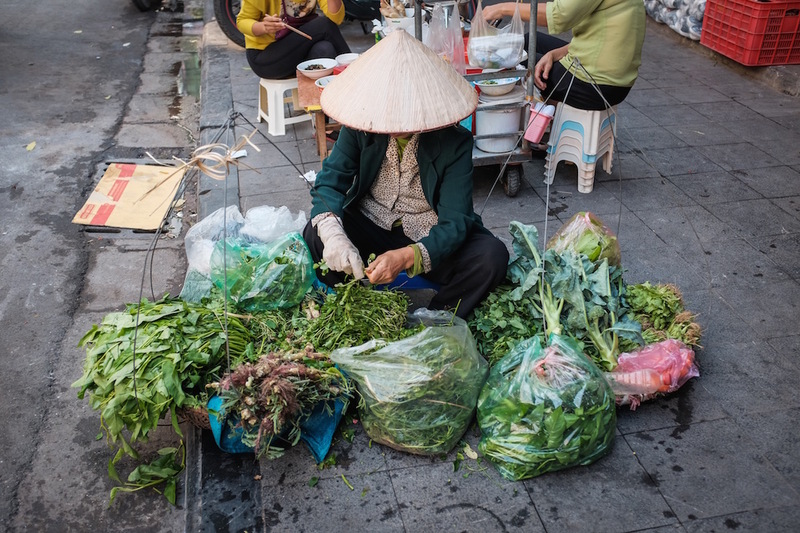 Have you been to Hanoi? How do you photograph hectic cities? I’ve had a handful of experiences with drunken photography too. The most extreme case was when I was totally drunk, rode a bicycle while shooting with the camera in one hand (using auto focus of course). I got some decent and even interesting results, but had to delete the majority of the photos. That made me laugh out loud thinking of a drunk person riding a bike with a camera! I can imagine that there would be some unique shots in there. My memory played a trick on me! I didn’t use autofocus. 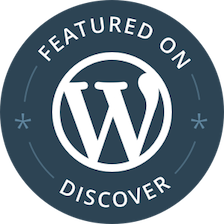 “The success rate was approximately 10% (If I remember correctly I came home with around 220 shots and ended up publishing 23 of them- the rest was deleted). Ha, that is awesome. Spray and pray. That can be a fun way to get photos, like out of a bus or train window, but I think your method from a bike while drunk is best. Drunk or not, I am terrible at photographing hectic cities. There’s just too much jumble to capture – too many people, wires, bikes, animals, cars, food stands, etc. I do best if I really narrow my focus. I still take a bunch of the whole-scene shots because it’s fun to look back at the chaos, but like yours, many of mine end up in the Trash. However, I really like some of the motion you’ve captured, inadvertent or not! Those must have been some tough days around your house. At least it was a great game and series. And he has LeBron. Well the keepers are certainly worth keeping. I think my fave is the guy getting a shave. So typical of that part of the world, and India. And the night shot is a beauty too. 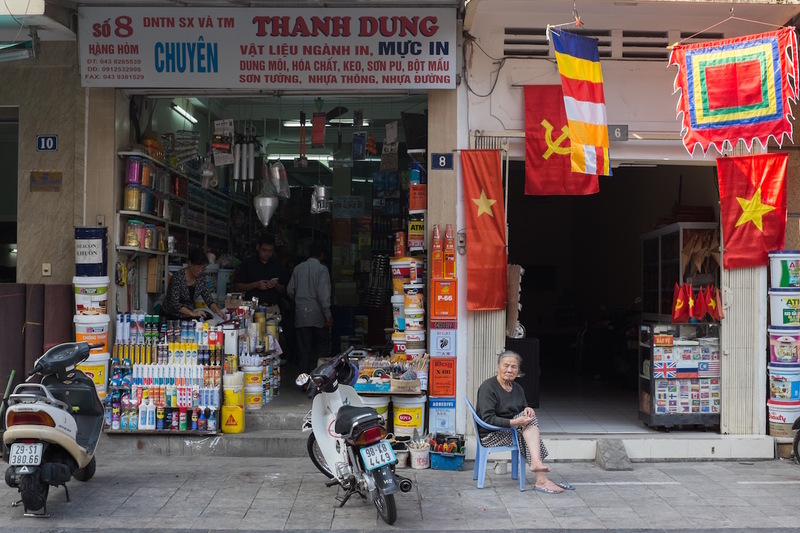 We loved Hanoi – so much going on that’s so very different from our part of the world. I didn’t know much about photography then, but I think I still got some okay shots. 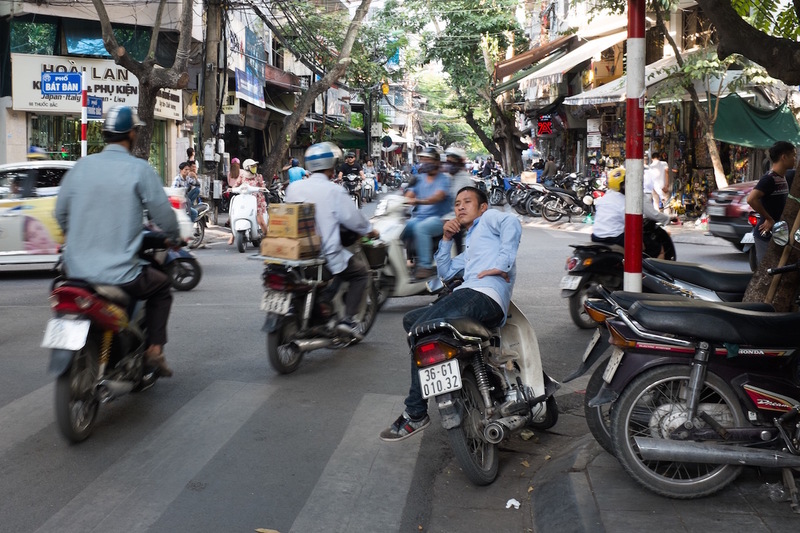 In hectic cities I just fire away at whatever appeals to me (like your shot of the guy lounging on his motorbike! That’s a great shot) and hope the background doesn’t interfere too much. Sometimes I get lucky. Thanks Alison. I saw the guy getting the shave and just walked over and snapped it. That was one of the few times I was able to get something I was happy with. 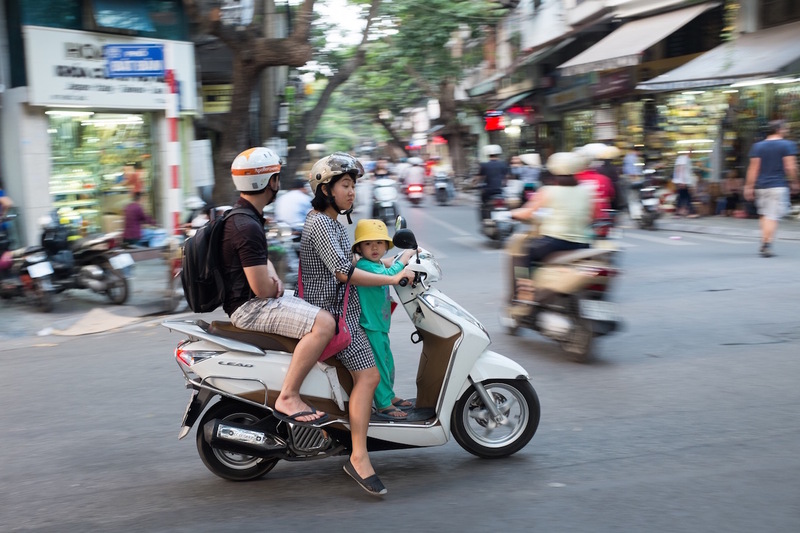 Agreed that Hanoi is a great city. It is so green for an Asian city. Your meshing of Apollonian and Dionysian artistic mindsets balance each other out. Well done. And quietly hilarious. Haha glad to know that even you the master of street photography has off moments. Or drunk ones. Master is a very strong word, but thank you Sue. 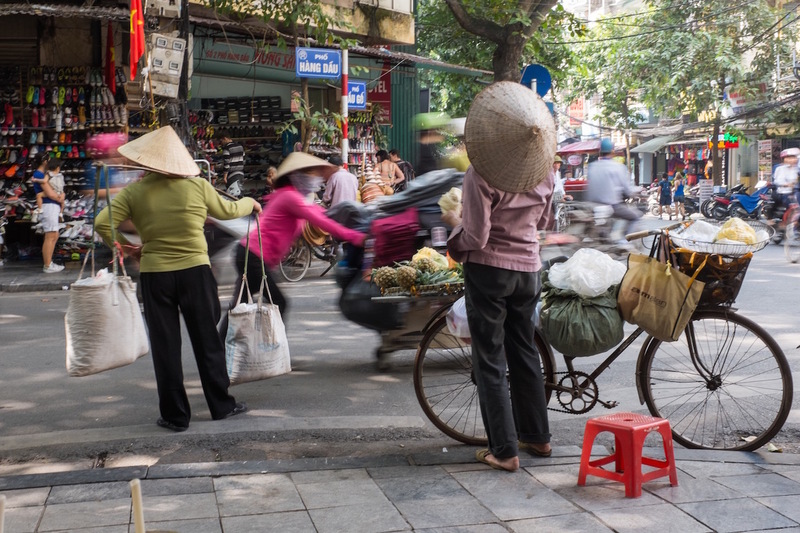 Hanoi has long since been on our list! Judging by your photographs, I’d say you’ve managed to capture some pretty great moments there. 🙂 I’ve seen my husband capture snaps like these absolutely sober! HAHAHA. 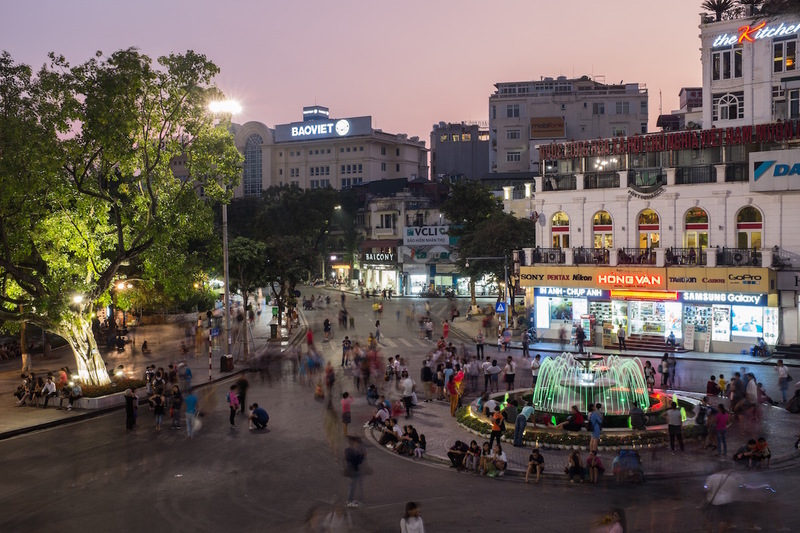 Hanoi is a great city – go when you have a chance. It is different than most Asian cities because it has a lot of parks, trees and lakes, but it is still crazy and busy. Well these turned out pretty good. Love the motion and chaos captured here specially the crazy stunts they pull on their motorbikes! Are those for real? Looks like a scene from a circus act. Yes, those motorbikes blow me away. I saw so many things that made me shake my head! The fruit lady and your barber are the stand outs!!! Love them. Thank you. I’ll do better about staying sober next time! Yeah, I’m not so great at shooting hectic anythings, including cities and diapers that need changing on some infant. And I don’t usually even pick up my camera if I’ve had a brew or two because I’m from the film generation and never wanted to waste expensive film! Old habits die hard. I like the ones the others above like, and love the one with the family on a bike…I still haven’t taken a good shot of five on a bike. The guy on bricks…that looks painful!! But I really like the one with the sign for Thanh Dung…well, for the obvious Badfish connotation one might conjure. Ah yes, film would change everything. That would have been an expensive and wasteful endeavor. I didn’t notice the Thang Dung sign, but I did see a Phuc Cafe and Dong Hotel. Ha…but it’s probably pronounced Pook, eh? I don’t know. But my way is more fun. 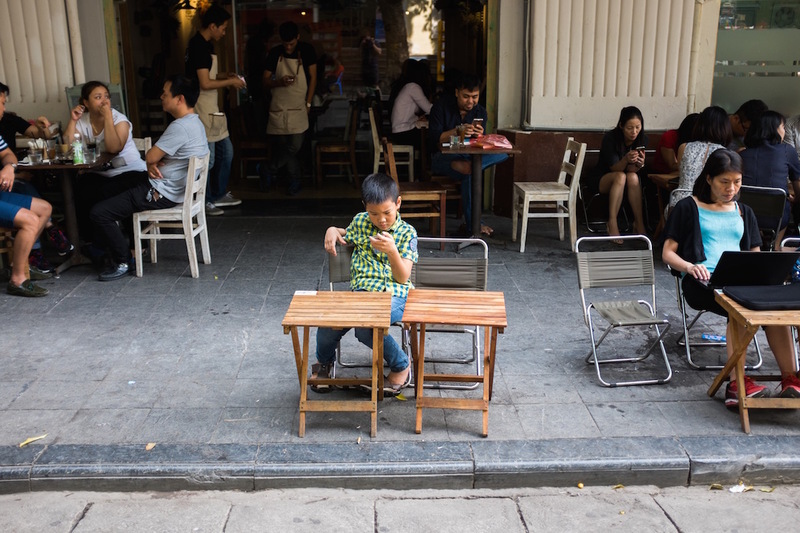 There was a Phuc Long cafe too. And a Dong Hotel. If you were a famous photographer, someone would find a way to spin that first photo as great art. Very true. That is when you know you have made it. Totally agreed. I think a couple of beers can relax the photographer and make it easier to approach people, but too many and people will run away from the drunk person! How did people react to your dog there? 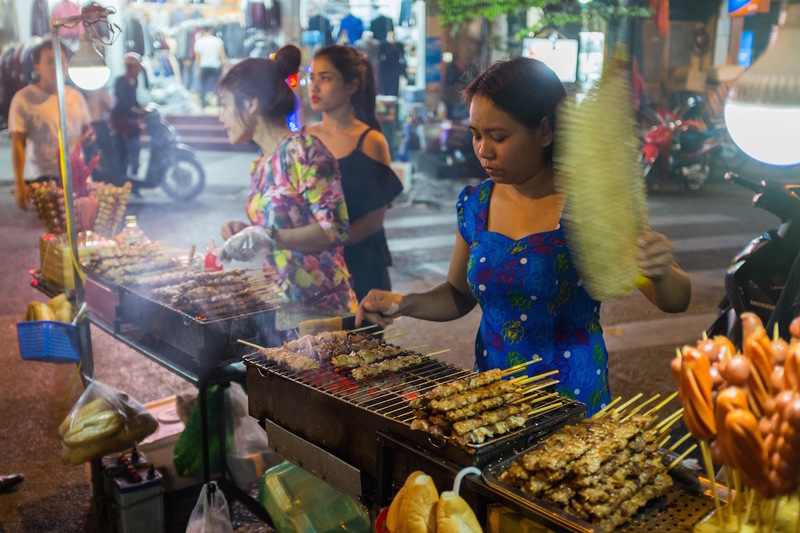 In Thailand, many people seem to have irrational fears of dogs, or maybe not irrational, since there are so many unpredictable street dogs. Your photos were even more fun with the story attached! Your comment about trying to capture the energy instead of finding order in the chaos struck a chord with me. Perhaps that’s my flaw and why street photography just doesn’t work for me – I’m trying to capture a mood rather than a vignette within the mood. Thanks for the tip – I’ll keep it in mind. Come to think of it, my success rate sober is about 2% also, so maybe I should just shoot drunk and make it more fun! 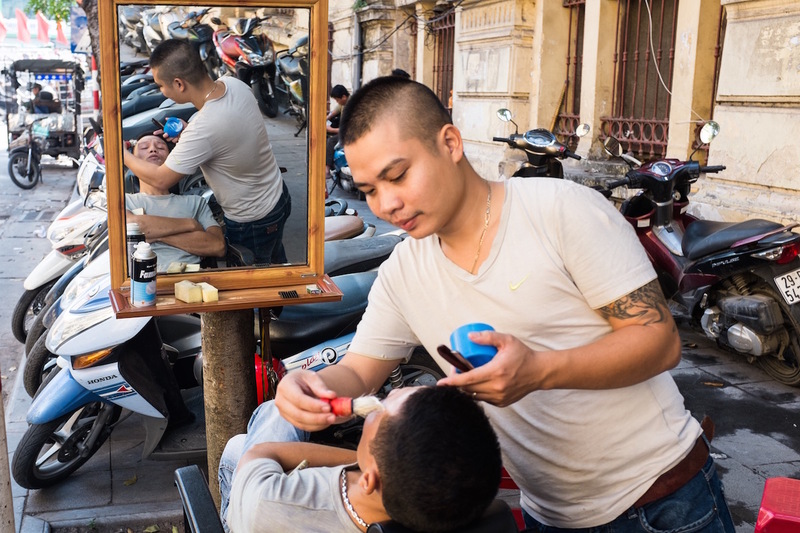 I saw the street barber and just went right to him and shot it. They both thought it was funny. I was sober on that one. It looks like you recovered quite well! I’m always a fan of the scooters/motor bikes laden with people and loads of stuff. Those folks must have great balance (they stick to tea). Those scenes always crack me up and I naturally want to shoot them. 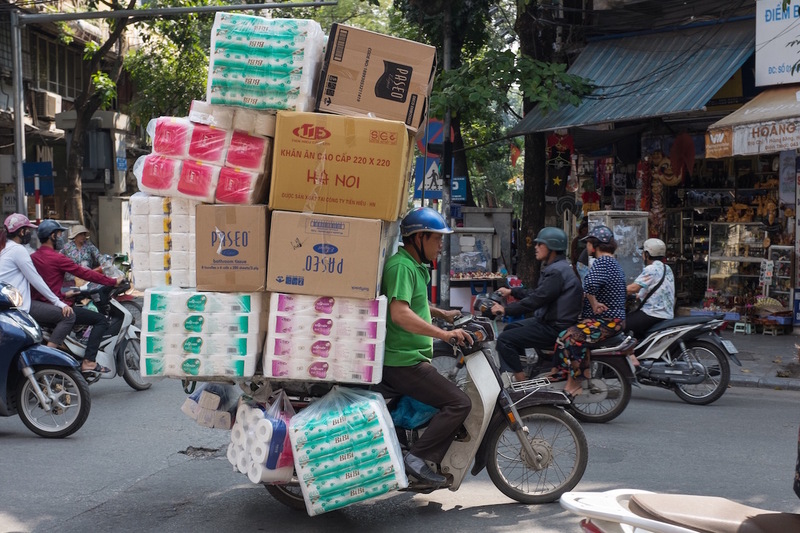 I wonder If I’d get over that if I lived in Hanoi? Yes, their balance is amazing, but I guess they’ve been doing it their whole lives. 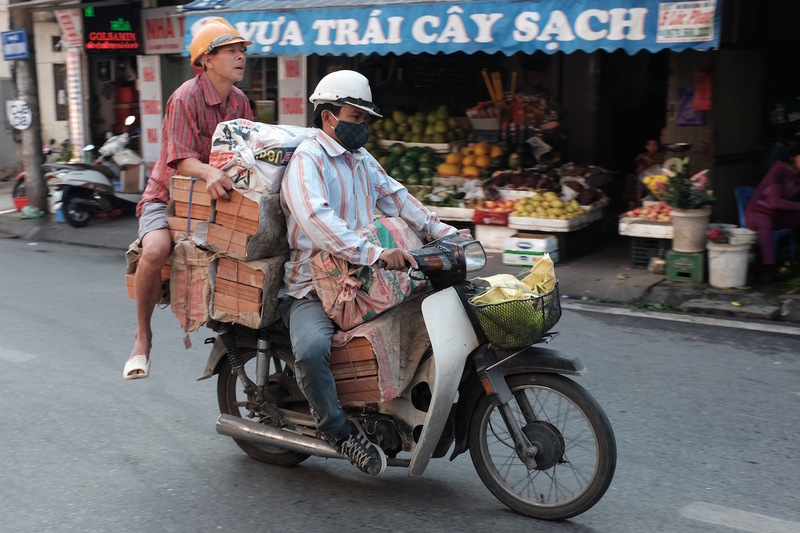 Hanoi is great. Will it be your first visit?